With the clever new Weber Gourmet Barbecue System for the Genesis series, you can build the ultimate outdoor cooking system. 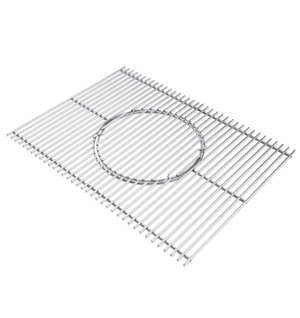 It starts with the heavy gauge stainless steel rod cooking grill. The grill has a removable insert and this is where the clever part really starts. In place of the insert you can add any of the Weber Gourmet Barbecue System accessories so you can create even more variety and excitement with your outdoor cooking.